In this hefty volume, the former president recounts his hardscrabble childhood in Hope, Arkansas; the illustrious academic career that took him to Oxford and Yale Law School; and his meteoric rise in politics. 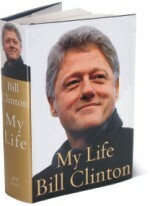 Offering a candid appraisal of his successes and setbacks, Clinton devotes plenty of space here to his White House years, paying particular attention to the policy initiatives he feels to be his true legacy. After unprecedented pre-publication media attention and build-up My Life rewards our enduring fascination with this charismatic and controversial figure celebrated by some as his generation's most brilliant politician and condemned by others for his personal excesses. 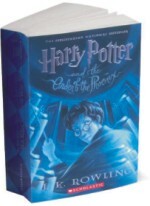 The fifth hefty installment to J.K. Rowling's renowned Harry Potter series takes a uniquely psychological and intensely dark turn, bringing the boy wizard at odds with his own identity and friendships as he continues to fight He-Who-Must-Not-Be-Named. Now fifteen years old with four Voldemort battles under his belt, Harry feels frustrated about the growing public skepticism about the Dark Lord's return. Unfortunately, the Ministry of Magic is also voicing its doubt, and all of Hogwarts comes under the watchful eye of an oppressive Ministry representative. Despite the additional problems of looming O.W.L. exams and Hagrid's inexplicable absence, Harry's main preoccupation is his vivid dreams that take him to places -- and make him witness events -- that horrify and intrigue him. These dreams provide a shocking clue to his very existence, and when eventually they lead Harry to confrontation, the wizard must cope with a tragic death and a telling prophecy about his future. Intricate in plot, charged with unease, and deeply fulfilling on every level, Rowling's continuation won't fail to leave fans open-mouthed and breathless for what's to come. In his final hours in the Oval Office, the outgoing President grants a controversial last-minute pardon to Joel Backman, a notorious Washington power broker who has spent the last six years hidden away in a federal prison. What no one knows is that the President issues the pardon only after receiving enormous pressure from the CIA. It seems Backman, in his power broker heyday, may have obtained secrets that compromise the world's most sophisticated satellite surveillance system. Backman is quietly smuggled out of the country in a military cargo plane, given a new name, a new identity, and a new home in Italy. Eventually, after he has settled into his new life, the CIA will leak his whereabouts to the Israelis, the Russians, the Chinese, and the Saudis. Then the CIA will do what it does best: sit back and watch. The question is not whether Backman will survive--there is no chance of that. The question the CIA needs answered is, who will kill him?